Shades of purple are in perfect harmony in this profoundly pretty arrangement. A lovely mix of classic and modern, ribbons and roses, it''s sure to make someone''s day! 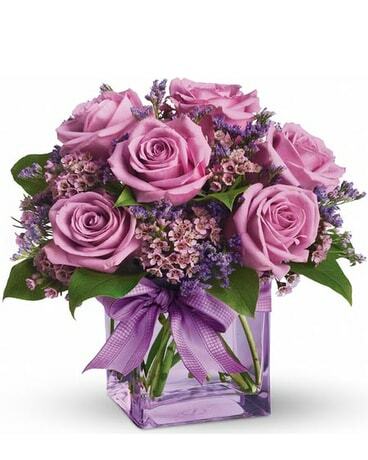 Lavender roses and waxflower, purple limonium and greens are hand-delivered in a clear cube vase that''s all wrapped up with a vibrant purple taffeta ribbon.